＞In 1976, the Nurses’ Health Study (NHS) cohort was established when 121 700 female registered nurses from across the United States, aged 30 to 55 years, answered a mailed questionnaire on risk factors for cancer and cardiovascular disease. ＞In the NHS, incident breast cancer was ascertained by biennial mailing of the questionnaire to participants. For any report of breast cancer, written permission was obtained from study participants to review their medical records. ＞Physical activity was reassessed in 1988, 1992, 1994, 1996, 1998, and 2000. ＞A total of 2987 women with stages I, II, or III breast cancer were included in the analyses. There were 463 deaths: 280 were from breast cancer. There were 370 breast cancer recurrences. Physical activity assessment occurred a median of 38 months after diagnosis; the 10th and 90th percentiles were 27 and 59 months, respectively. The median length of follow-up for the breast cancer mortality analyses was 96 months; the 10th and 90th percentiles were 47 and 187 months, respectively. ＞Despite a significant linear trend, the RR was relatively flat in the 3 highest activity categories. ＞The cutoff of 9 MET-hours per week was chosen for these analyses because this was the predetermined category that divided the cohort almost in half. The RR of death for women who engaged in 9 or more MET-hours per week of physical activity was 0.63 (95% CI, 0.48-0.81) compared with less than 9 MET-hours per week. 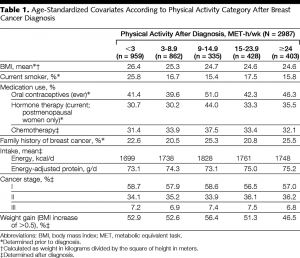 ＞Among women with a BMI of 30 or higher and compared with women who engaged in less than 3 MET-hours per week of physical activity, the RR of death from breast cancer was 0.63 (95% CI, 0.26-1.52) for 3 to 8.9 MET-hours per week; 0.78 (95% CI, 0.20-3.04) for 9 to 14.9 MET-hours per week; 0.22 (95% CI, 0.03-1.82) for 15 to 23.9 MET-hours per week; and 0.36 (95% CI, 0.08-1.55) for 24 or more MET-hours per week (P for trend = .09). These results suggest additional benefit of physical activity for obese women; however, this analysis was limited by the small number of breast cancer deaths (n = 38) among women with a BMI of 30 or higher. ＞Physical activity appeared beneficial to women whose tumors had both estrogen and progesterone receptors (RR, 0.50; 95% CI, 0.34-0.74) and not to women whose tumors lacked hormone receptors (RR, 0.91; 95% CI, 0.43-1.96). 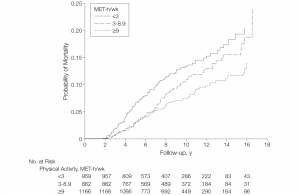 ＞We found that any category of activity higher than the reference category of less than 3 MET-hours per week was associated with a decreased risk of an adverse breast cancer outcome. ＞A randomized trial of physical activity among overweight postmenopausal women demonstrated declines in serum levels of androgen and estrogen. ＞Physical activity might also improve survival through acute and chronic improvements in insulin resistance and reduction in hyperinsulinemia. The associations we observed may change over time as the use of aromatase inhibitors to suppress hormone levels becomes more popular. ＞A recent report of physical activity levels among breast cancer survivors in the Health, Eating, Activity, and Lifestyle (HEAL) study found that women diagnosed with a higher stage of disease reported 15% more time engaged in physical activity compared with women diagnosed with in situ disease, although this difference was accounted for by household and not by recreational activity. ＞Women in the highest category of activity like the rest of the cohort were primarily walkers but they walked for longer periods. Forty-five percent reported walking 5 or more hours per week, 28% reported bicycling 1 or more hours per week, and 28% reported participating in aerobics classes 1 or more hours per week. ＞Overall, given the uniform evidence of the benefits of moderate physical activity to health, we believe that it is unlikely that exercise at the highest levels is detrimental to women with breast cancer. ＞Our study was limited by the fact that physical activity was self-reported. ＞Our results suggest that physical activity after a breast cancer diagnosis may lower the risk of death from that disease. The benefit was seen particularly among women who had tumors overexpressing estrogen receptors and progesterone receptors. ＞The maximal benefit occurred among women who performed the equivalent of walking 3 to 5 hours per week at an average pace (2-2.9 mph) with little evidence of increased benefit for more exercise. ＞Women with breast cancer who follow the Centers for Disease Control and Prevention recommendations for all individuals in the United States to exercise at moderate intensity for 30 or more minutes per day for 5 or more days per week may survive longer. ＞Funding/Support: The research for this article was funded by grant CA87969 from the National Institutes of Health. ＞Physical activity has been shown to decrease the incidence of breast cancer, but the effect on recurrence or survival after a breast cancer diagnosis is not known. 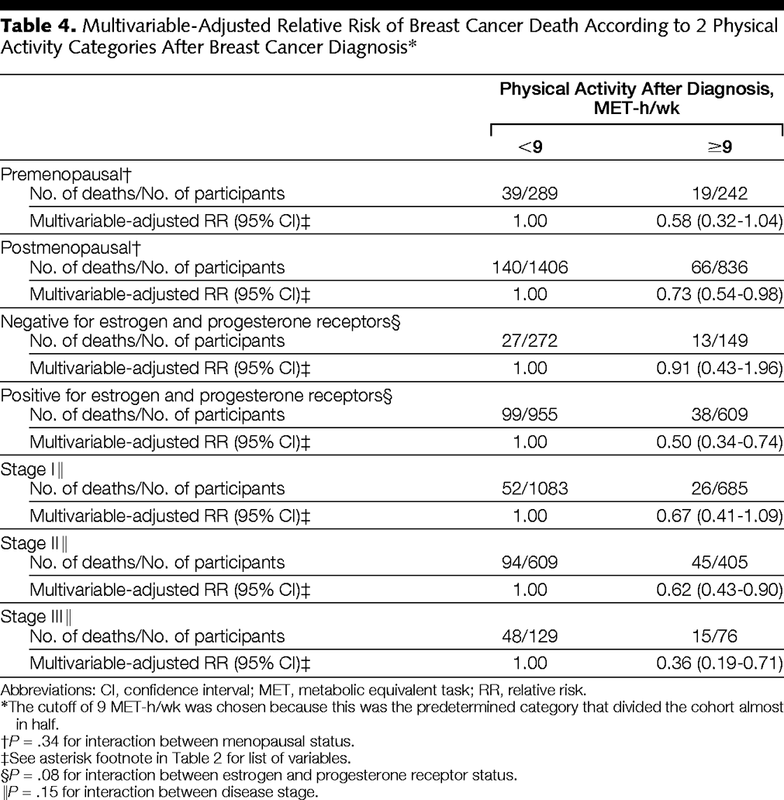 ＞To determine whether physical activity among women with breast cancer decreases their risk of death from breast cancer compared with more sedentary women. ＞Prospective observational study based on responses from 2987 female registered nurses in the Nurses’ Health Study who were diagnosed with stage I, II, or III breast cancer between 1984 and 1998 and who were followed up until death or June 2002, whichever came first. 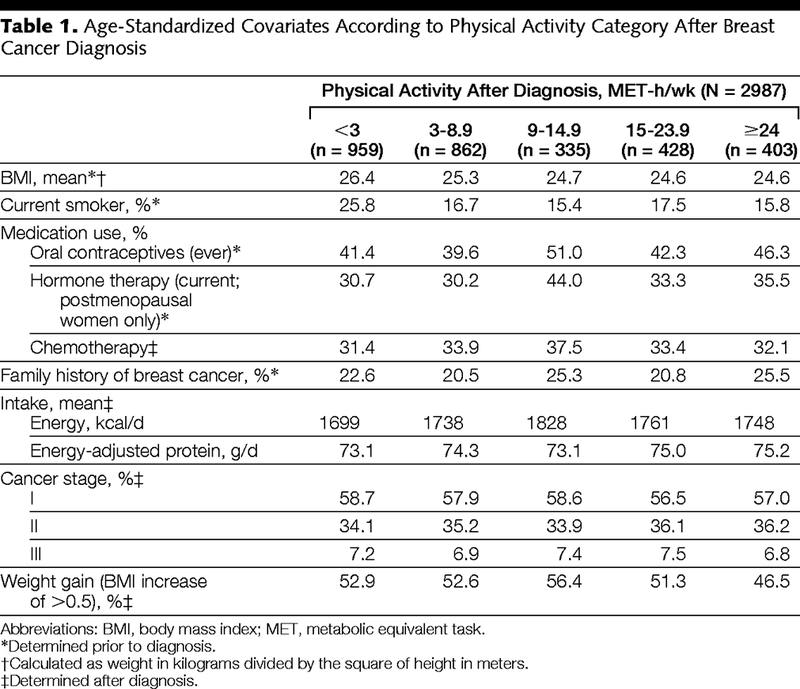 ＞Breast cancer mortality risk according to physical activity category (<3, 3-8.9, 9-14.9, 15-23.9, or ≥24 metabolic equivalent task [MET] hours per week). 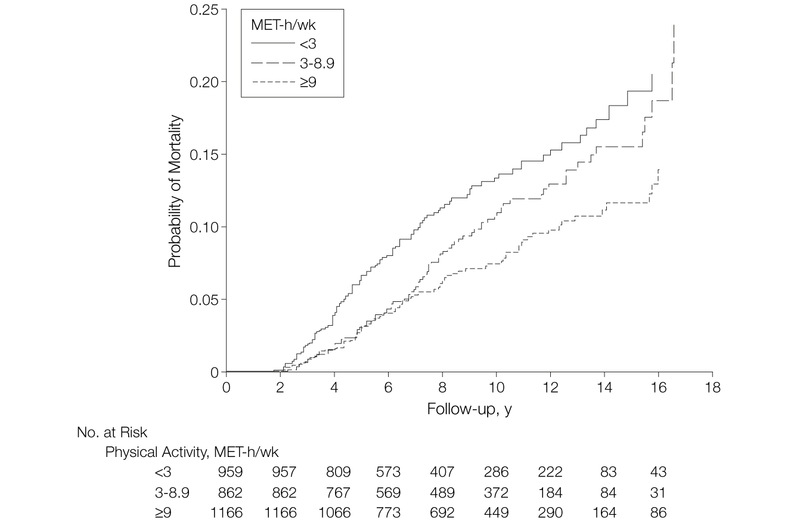 ＞Compared with women who engaged in less than 3 MET-hours per week of physical activity, the adjusted relative risk (RR) of death from breast cancer was 0.80 (95% confidence interval [CI], 0.60-1.06) for 3 to 8.9 MET-hours per week; 0.50 (95% CI, 0.31-0.82) for 9 to 14.9 MET-hours per week; 0.56 (95% CI, 0.38-0.84) for 15 to 23.9 MET-hours per week; and 0.60 (95% CI, 0.40-0.89) for 24 or more MET-hours per week (P for trend = .004). ＞Three MET-hours is equivalent to walking at average pace of 2 to 2.9 mph for 1 hour. ＞ The benefit of physical activity was particularly apparent among women with hormone-responsive tumors. The RR of breast cancer death for women with hormone-responsive tumors who engaged in 9 or more MET-hours per week of activity compared with women with hormone-responsive tumors who engaged in less than 9 MET-hours per week was 0.50 (95% CI, 0.34-0.74). ＞ Compared with women who engaged in less than 3 MET-hours per week of activity, the absolute unadjusted mortality risk reduction was 6% at 10 years for women who engaged in 9 or more MET-hours per week. ＞Physical activity after a breast cancer diagnosis may reduce the risk of death from this disease. The greatest benefit occurred in women who performed the equivalent of walking 3 to 5 hours per week at an average pace, with little evidence of a correlation between increased benefit and greater energy expenditure. Women with breast cancer who follow US physical activity recommendations may improve their survival. 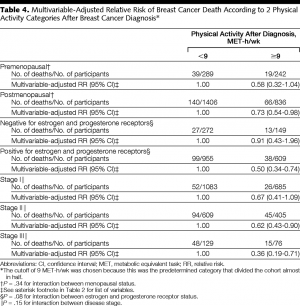 Epidemiologic issues related to the association between physical activity and breast cancer.